Does J.J. Abrams Have the Script for Star Wars Episode VII Already? 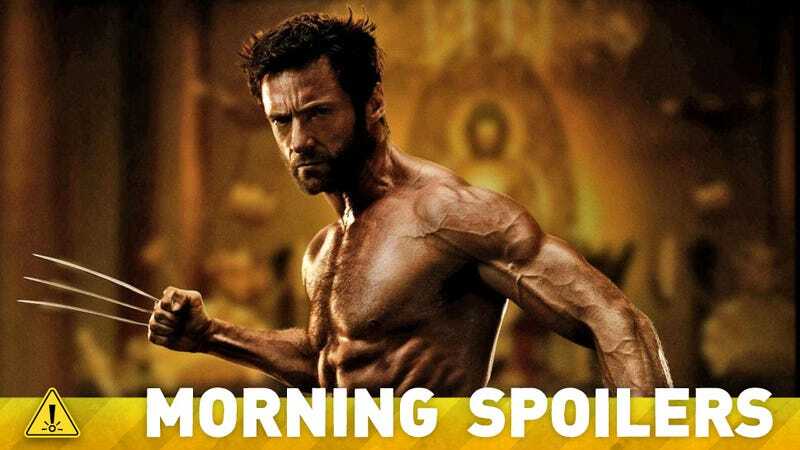 Hugh Jackman hints at how The Wolverine will set up X-Men: Days of Future Past. Caesar will be talking by the end of Dawn of the Planet of the Apes. What role is Doctor Who's Mark Gatiss playing on Game of Thrones? Spoilers ahead! If you stay on after the credits you get to see a nice little preview for Bryan's next film. Caesar talks at the end of the movie, he has some level of speech. I wanted to make sure we're continuing to go along the path of evolution without missing it, it was so delicious to watch in the first movie. It's not like now they are talking in verse. Hopefully the movie is emotional and thrilling as you watch the apes come into being. Where does the movie take place? The ape civilization is in the woods, between Vancouver and New Orleans, the world after what happens with the simian virus flu. The two main locales are San Francisco and the Muir Woods where the ape civilization is born. We'll be doing a little shooting in San Francisco as well. A lot of the Louisiana shooting was to build huge wood sets outside in the woods to add realism, enormous exterior streets. We're shooting in the rain, in the wind, all on location out in the open in the elements. Co-creators Graeme Mason and John Fawcett spoke to Entertainment Weekly about the direction of season two, saying that the season premiere will pick up “maybe two hours” after season one’s finale and “launches like a rocket” from there. MANSON: We definitely will be continuing looking at bonds and themes of motherhood in all its guises that we show — Mrs. S. (Maria Doyle Kennedy) and the foster motherhood, Sarah and Kira (Sklyer Wexler) — as well as testing and stretching the bond between our three main women (played by Maslany), Cosima, Sarah and Allison… Sarah’s going to be on the run in season 2. FAWCETT: She’s really freaked out because she’s got bad guys after her. FAWCETT: Before getting into any other further clones, we’ve got this new clone that we really don’t know very well, and Rachel is going to figure in pretty strongly in season 2. She’s not just a bad guy. She’s got a lot of layers to her and has a very, very interesting backstory. FAWCETT: I don’t know, I think she was pretty dead. She looked pretty dead to me. MANSON: Shot in the heart, but, you know, she’s kind of a bad penny. Who knows? Here’s a new promo for the new J.J. Abrams series. What we’ve tried to do, and one of the things that attracted me most to the show, was that it is true science fiction in the sense that it’s not one device. What kind of bugs me about contemporary science fiction often is that it’s normally one device, one occurrence, or one thing that’s happened, one problem if you like, but after that there’s really nothing. And I always sit at home and go, ‘well fix the problem,’ because if you just fix that one problem then everything goes back. It does have all of those constructs of true science fiction. It has its own rules of physics, of science, it has its own social rules. The world has changed to a large enough degree that every character has to adapt and cope. It does adhere to that, but at the same time be don’t sit around on our heels too much and stare at it all, because the reality is if you put characters in a world, the world’s going to be just the world for these characters. They’re going to be marching off trying to do all the things that people, or aliens, get to do and want to be. So we do try and wear our science fiction lightly if you like, but at the same time there’s an incredibly complex backstory and mythology to the show, that we spend at least half of our time making sure that we’re honouring. It’s a two-way street. We have stories and events if you like that move over into the show, almost in real time. For instance when I burned out of the game on my roller, the show launched two weeks later which is pretty much what we decided is how long it would take you to go across country from San Francisco where the game takes place, to St. Louis where the show takes place. There have been major climactic events, like Razor Rain was a major climactic event, or the plague and the flu which swept across the country in opposite directions, so from game to show and show to game. So those kind of things we do, and they’re seeded far in advance. And then there’s character interactions, where characters will leave the game and come onto the show, like I did in the beginning, and also the opposite. And then we get into the more micro or incidental crossovers that happen on a more week-to-week basis if you like.